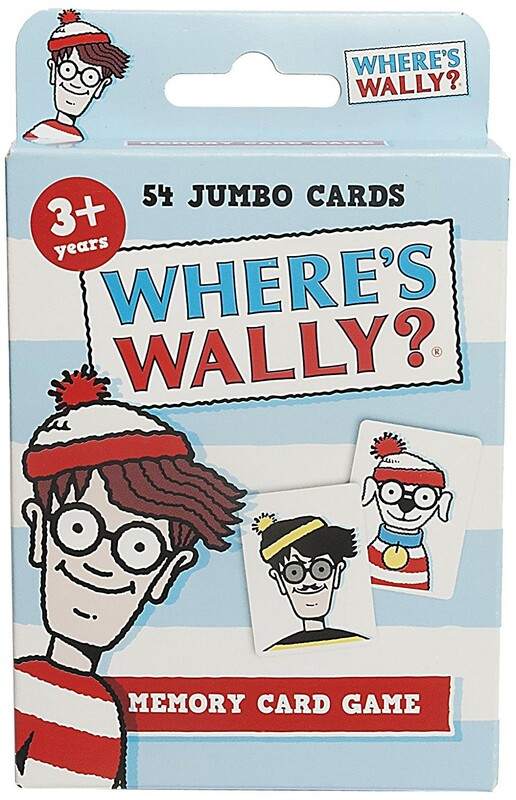 A bright and colourful memory card game featuring the elusive Wally, Wenda, Woof and Wizard Whitebeard. The aim of the game is to collect the most matching pairs by remembering where the cards are located once turned upside down but watch out for the mischievous Odlow, he's out to mess things up! Place all the cards facing down on a table or floor so that no card is touching another. The youngest player goes first by turning over 2 cards at random. If they match identically, ie 2 satchels, that player takes them and may then turn over 2 more cards. If the pairs don't match, they are turned face down again and the next player continues in the same way. If any player turns over an ODLAW card that player must shout ODLAW!, take the ODLAW card, then shuffle all the remaining cards in play so that no one can remember the position of any cards. The player who collects the most matching pairs wins! This memory game contains 54 Jumbo cards with easy rules for even the youngest of players. The game helps children with memory skills and learning how to take turns, along with developing the ability to play together. The game is for 1 or more players and suitable for children 3 years and over.